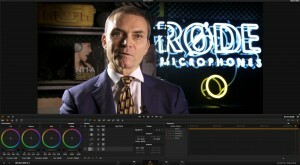 The Resolve 10 Edit tab with graphics on track 2. The concept of “Round-Tripping” a project between different software packages for finishing has been with us for a few years now. In a sense, it always has been in some form or another. I remember the excitement of walking into the telecine suite with selected neg rolls of film and an EDL for the colour grade, which then had to be re-conformed in an edit suite. Now we have just experienced the “one-way trip” with DaVinci Resolve 10 on a real project with a tight deadline… and it’s great. The concept of the the round-trip came to wide prominence with Apple’s Final Cut Studio which had Soundtrack Pro and Color as dedicated sound and grading applications and Apple implemented semi-automated functionality for sending the pictures and sound to the dedicated application and then bringing everything back together in the Final Cut Pro timeline. There are many other implementations of the concept but in one form or another, it is a mainstay of the industry. When Blackmagic Design announced that Resolve 10 would have the capacity to function as a finishing system as well as a grading system I was a little skeptical. Not that I doubted the merit of their idea or their ability to implement it. Just the practicality of trying to add on-line editing functionality to a very mature and finely-honed colour grading system. 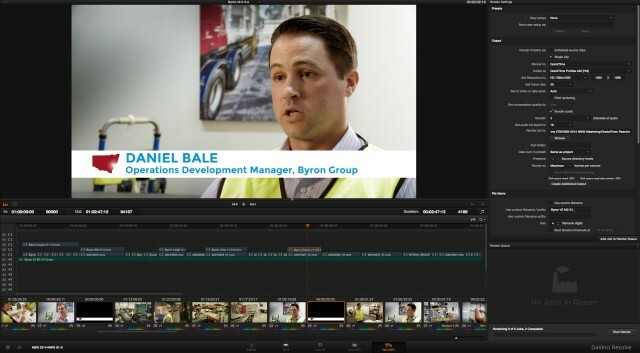 Our most recent project for the NSW State Government is a series three micro-documentaries about the local manufacturing industry and it was planned with our existing FCP & Resolve round-trip workflow. Early in the project it was obvious that we would have a very tight turnaround bacause the timing of the timing of the shoots was determined by the availability of the high level executives we needed to interview. We tend to be very conservative about changing our workflow during a project but because we wanted to grade in Resolve 10 and it needs to run on Mac OS 10.9 Mavericks we can’t run FCP 7 on the same machine, so we started to look at ways of streamlining our finishing process. One experiment that we tried was creating an FCP-X XML to round trip to the mew version of FCP rather than back to the older version where the edits were done. It was interesting that this actually is possible and we were able to get one preview done that way, although the time savings were minimal compared to our existing workflow. 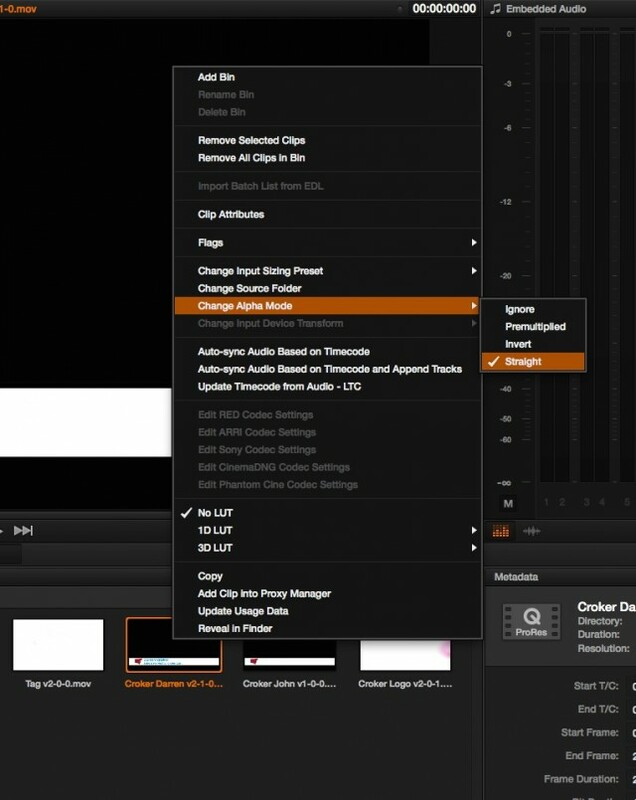 The Alpha Channel options in Resolve. So I started to explore what we would need to be able to do to finish completely in Resolve. What I quickly discovered was that Resolve 10 was very much up to the task. I was able to replace the temp opening and closing graphics with the finished renders and add the lower-third title supers as well. These were rendered in Apple ProRes 4444 with an Alpha Channel. It was straightforward to drop these onto the layer above the interview footage and adjust the timings as required. The only trick we found with this was that Resolve automatically set the Alpha mode on the 4444 files to “Ignore” which gives you black where there should be transparency. In the Media tab, right clicking on the clip brings up a contextual menu where one of the options is “Change Alpha Mode” and it’s then very easy to change this to “Straight” for a normal alpha channel composite. In the Grading tab the supers appear as separate shots in the timeline so that they can be graded (or in this case ignored) separate from the underlying shots. At the same time they display in their finished form in the viewer. It is a nice little advantage to be able to do the final pass of the grade with the supers in place and seeing how the grade is looking in that context. In one of the videos I actually tweaked the grade slightly because the skin tones looked a little too dark once the white reference from the lower-third graphic changed the appearance of the shot. The final piece of the puzzle to be able to complete this project without returning to any editing software was to be able to bring in the mixed audio and re-sync it with the vision. Again this proved to be much faster and simpler than we expected. The sound needs to be right when you’re profiling Peter Freedman from RODE! Our current sound workflow is to take an XML out of FCP into a mixing template we’ve created for Logic Pro where the mix is built and the fine-tuning of the audio edits can be done at sample level rather than being limited to video frames. The mixing is then done and bounced out as a single WAV or AIFF. We then take this into Harrison Mixbus to add extra warmth and clarity to the overall mix. The final uncompressed WAV file from Mixbus was previously reunited with the graded vision in FCP but this was seamless in Resolve and we had no challenges with sync or compatibility. This also meant that our final pass of the grading was done with the fully mixed audio and, as with the graphics, this can actually inform the grading choices in certain circumstances. The big payoff of the process came when we were ready to make final delivery up against the tight deadline. Being able to kick off a single render and minutes later to have a finished master file of the video made it possible for us to devote more creative time to both the grading and the mixing. than would have been possible with any variation of a roundtrip. Once we had a master in the ProRes HQ format we used MPEG Streamclip to produce an MP4 web preview at 1,200 Mbps and an HD MP4 at 10,000 Mbps for delivery to the client. I was just thinking about when I last experienced such an easy run to the finish line with a project and I realised that it is nearly 15 years since I started finishing certain projects entirely on desktop systems. This new DaVinci Resolve workflow has been easily the smoothest and fastest finishing process that I’ve yet come across. 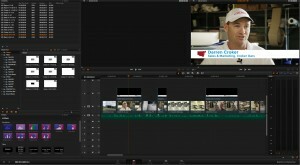 I’ve thought for a long time now that the grading probably belongs in the edit timeline. But now it looks like the final version of the edit timeline, belongs in the colour grade. The Deliver tab in Resolve where the final render is configured.